Beneath the Lighthouse by Julieanne Lynch is a horror tale featuring death, ghosts, and coming of age. After the death of Emer, there has been an unsettling emptiness in the house and no matter how hard Jamie and his siblings pretended or prayed, that reality haunted everyone in the home. Jamie McGuiness can’t help frequenting the lighthouse where the body of his sister was found, but he isn’t the only one who lurks around the place. There are ominous ghosts whose presence can only mean evil. An encounter with a spirit will set Jamie on a dangerous path to uncover family secrets and old grudges as he fights to reconcile old feuds. Will he be drawn into the darkness of the dead or can he survive and make things right? Julieanne Lynch is a master storyteller and I enjoyed the way she pulls the different elements of the story together. I was hooked by the beauty of the prose. The power of the prose — descriptive, and loaded with vivid imagery — is one of the strong appeals of this story. The author makes the reader feel the story by evoking emotions with clarity of expression and aptness of diction. Each sentence evokes a strong feeling and the author uses this style to allow readers to understand the dynamics in the McGuiness family, the emotions of the protagonist, and the pervading sense of horror that permeates the narrative. The writing style, including the formatting, the unique phraseology, the paragraph breaks, creates an enjoyable reading experience. This is a beautiful story with a tricky plot, compelling characters, and awesome dialogues. I enjoyed the way the author allows the accent in some of the characters to come out in dialogues — a great example is Lenny, who reflects an uncouth personality. The story is also fast-paced and a great work of entertainment. Beneath the Lighthouse has great world building, relatable characters, and an exciting plot in a story that is deft and balanced. In Beneath the Lighthouse, Jamie McGuiness is a 16-year-old with a bleak life. His father, Jack, is an abusive alcoholic, spiraling down fast to his self-destructive rage. His abused mother, Sonya, is trying her best to look after Jamie's younger siblings and appease his father at the same time. Jamie himself is not spared from Jack’s rage, verbally and physically, and all this started after his younger sister, Emer, died three years prior. Things are beginning to get worse for Jamie when a ghost latches herself onto him during his usual visit to the lighthouse, where Emer’s body was discovered nearby. This YA novel by Julieanne Lynch has a familiar concept in terms of horror/paranormal genre, but the plot is slightly more multifaceted compared to other YA ghost stories that I’ve read before. The theme of domestic abuse gives an emotional depth to the story line and some characters, especially Jamie and his mother, Sonya. Jamie’s sense of responsibility as the oldest sibling is at times a double-edged sword, evident in his guilt for Emer’s death, who wasn’t exactly a saint, to easily warrant my empathy. The drip feeding of details about her through flashbacks makes the reading engaging. Except for the ghost, some characters initially seemed slightly trivial for me, such as Jamie’s good friend, Lenny, and his love interest, Claire, until they established their roles deeper in the second and third acts. Beneath the Lighthouse is not the most spine-chilling novel I’ve read, but it offers enough of a sensible take on family loss, survivor's guilt, and domestic abuse combined with adequate scary paranormal moments for its intended YA readers. Jamie’s entire family is still reeling from the death of his younger sister, despite the fact that 3 years have passed since her body was discovered near the old lighthouse. At the time, officials had ruled her death accidental, but a part of Jamie was never quite convinced that it really was an accident. Now, Jamie finds himself inexplicably drawn to the very place her body was discovered, comforted by a sense of companionship with his lost sister. The fact that it gives him a place to escape his drunk, abusive father is just an added bonus. But when a mysterious, vanishing figure makes itself known only to Jamie, his already turbulent world will suddenly become much more terrifying and dangerous. It’s up to Jamie to discover what really happened on that fateful night as dark secrets are unearthed beneath the lighthouse. Beneath the Lighthouse by Julieanne Lynch is a gripping supernatural mystery that will grab your attention on the first page and not let go. Impossible to put down, Beneath the Lighthouse features a wonderfully complex and detailed story line, an assorted cast of fascinating characters, and a shocking twist ending that you definitely won’t see coming. The quality of the writing is excellent, pulling you into the story and allowing you to feel Jamie’s pain, his frustrations, his joy, and his darkest fears. I would highly recommend this book to anyone who enjoys gripping suspense, strong supernatural themes that venture into the afterlife, or even simply a good, well-written plot. Although horror is not my preferred genre, the plot of Beneath the Lighthouse by Julieanne Lynch intrigued me enough to read it. I am delighted to report that this is more than a horror story. Beneath the Lighthouse has many ingredients of a fascinating read. I was hooked from the beginning to the end and I couldn't get enough. The story revolves around Jamie McGuiness, a teenage boy, and his family - his mom (Sonya), his dad (Jack), and his siblings. Jamie is fed up with his father getting drunk and beating his mom all the time. He is frustrated with himself for not being able to stand up to his dad and with his mother for putting up with Jack's spiteful violence. Jamie's family was not always this messed up. Jack was a good dad to the kids and he used to respect and love Sonya. Something snapped inside him when his daughter, Emer, was found dead. The case was deemed an accident; however, Jamie never believed it to be so. Since that day, Jack's behavior changed completely towards his family. He became a violent drunk. Jamie became even more introverted than ever. He began questioning everything, feeling guilty for not being able to take care of his sister, and sulking about his family's current situation. While he was struggling with his negative thoughts, the only place that soothed him -- the lighthouse where Emer's dead body was found -- became the source of an even bigger problem for him. A trapped soul, Ileana, noticed him and decided to make him her savior. Becoming her savior might bring some answers to Jamie, but what he doesn't know is the cost of these answers might not be an easy one. Beneath the Lighthouse has several layers and that's what makes it an exciting book. When a woman surrenders herself to an abusive partner, she unwittingly puts her whole family at risk. Jamie and his siblings became first-hand witnesses to their mom's swollen eyes and bruised face and that terrified them but also changed them -- especially Jamie. He felt responsible for not being able to save her from his dad. This is not how a kid should feel. Fortunately, Jamie has a best friend to share his problems with. By introducing this friend, the author has very cleverly inserted one more layer into the story -- the importance of a good friend. The horror part of Beneath the Lighthouse is spread evenly throughout the story. Since the moment Ileana appeared, she brought a feeling of dread, unpredictability, anger, and -- unexpectedly enough -- hope with her. I could not decide whether she would help Jamie finally take a stand against his father or would become another problem for Jamie. The author is definitely an expert in writing paranormal fiction and that was evident in the way she chose words and wrote chilling horror scenes. 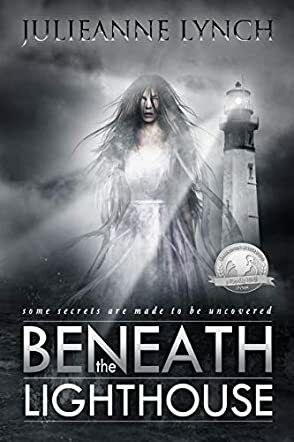 Paranormal fiction lovers would definitely enjoy Beneath the Lighthouse and be on the edge of their seats because of all the twists and intrigue of the plot. Beneath the Lighthouse by Julieanne Lynch is a young adult horror fiction novel which takes place in Northern Ireland. It is the last day of the school year for sixteen-year-old Jamie McGuiness, but even before he sets foot on school grounds strange things begin to happen, things he can’t explain. Though, that’s the least of his worries. It is immediately clear that Jamie doesn’t live a normal or wholesome home life. Between having to care for his mother and his siblings, Jamie must deal with his alcoholic and abusive father. Of course, it wasn’t always like this. Three years ago life had been dandy, but that was before Jamie’s twelve-year-old sister, Emer, began to act up and before she was found dead at the lighthouse. Now with everything that's happening, Jamie can’t tell if he’s going crazy or if there is something truly sinister going on. For me, the strength of Beneath the Lighthouse did not depend on the horror aspect; in fact, the horror was mild compared to the suspense which Julieanne Lynch has mastered. I liked the slight parallels built between Jamie and Illiana, their personalities both molded by loneliness and fear. I also enjoyed how Emer’s story was told, jumping backward and forward from three years prior to the present day, slowly lining up to subsequently come together to a satisfying end. I highly recommend Beneath the Lighthouse. The pacing of the novel is so deliciously well done that fans of horror-mysteries and suspense will find it hard to put this book down.